Peter Frank is Senior Curator at the Riverside Art Museum and an art critic for the Huffington Post. He was previously art critic for the LA Weekly and Editor of THEmagazine Los Angeles and, in the 1990s, of Visions Art Quarterly. Before moving to Los Angeles, Frank was art critic for The Village Voice and The SoHo Weekly News in his native New York. Frank contributes articles to numerous publications and has written many monographs and catalogs for one person and group exhibitions. He has organized many theme and survey shows for placement at institutions throughout the world, from the Museo Reina Sofia in Madrid to New York's Guggenheim Museum. He has taught at colleges and universities and he has lectured all over North America and Europe. Frank received his B.A. and M.A. in art history from Columbia University. 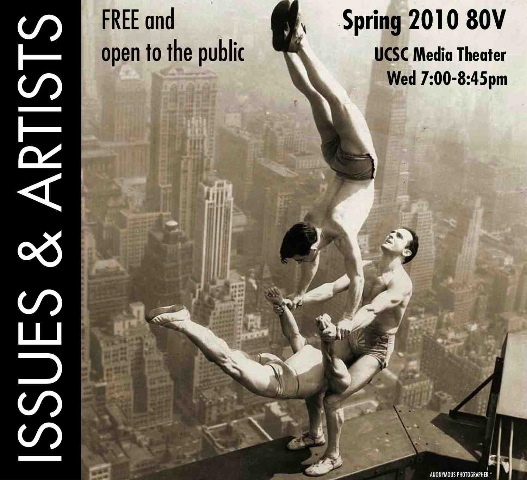 Issues and Artists is part of the UCSC Visiting Artist Program, taught by Robert Flynn Johnson this quarter, and focuses on key issues in contemporary art, art theory, and curatorial practice through lectures, discussions and readings. All visiting artist lectures listed are free and open to the public. Parking on campus requires purchase of a guest parking pass at the Performing Arts lot.